Last week Snapchat announced on-demand geofilters. This is huge news for marketers, especially those with smaller budgets that can’t afford to shell out five or six figures on a 24-hour campaign. You have to submit your filter at least 24 hours before you expect it to go live. After running a few ourselves, all of our filters have been approved in 12 hours or less. Reporting updates at 8 am PST every day. The reports will allow you to see how many people have viewed and used your filter. Your filter should not cover the entire screen or be too promotional. Feel free to include your branding, but don’t make the screen feel like an ad. No contact information can be on your creative. This includes website URLs, social media handles, and phone numbers. However, you can include your brand name or logo. Once your on-demand geofilter is running, it can be cancelled at any time. If you choose to cancel before your scheduled end time, Snapchat will refund you for the time you filter was not live. Make sure you love the filter you submit! If you decide you want to make an edit, you’ll have to cancel your previous submission and resubmit. If you choose to plan in advance, which we encourage, keep in mind that you will be charged for your filter once it is approved. This means you could be billed by Snapchat days, weeks, or even months before your filter runs. I highly recommend engaging with the on-demand geofilters before it is too late. Just like any other hot ad product, Snapchat users will eventually ignore geofilters if they become oversaturated with ad-like material. 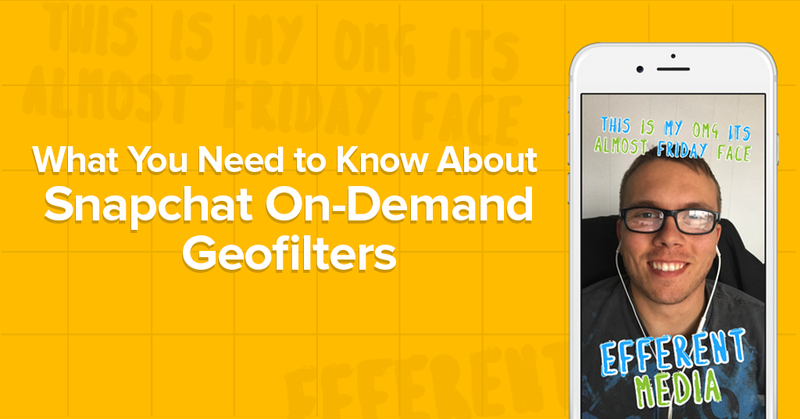 You can learn more about the on-demand geofilters here.